Religious fanaticism is uncritical zeal or with an obsessive enthusiasm related to one's own, or one's group's, devotion to a religion – a form of human fanaticism which could otherwise be expressed in one's other involvements and participation, including employment, role, and partisan affinities. "Spiritual needs"... human beings have a spiritual longing for understanding and meaning, and given the mystery of existence, that spiritual quest can only be fulfilled through some kind of relationship with ultimacy, whether or not that takes the form as a "transcendent other." Religion has power to meet this need for meaning and transcendent relationship. "Attractiveness"... it presents itself in such a way that those who find their way into it come to express themselves in ways consistent with the particular vision of ultimacy at the heart of this religious form. A "live option"... it is present to the moral consciousness as a live option that addresses spiritual need and satisfies human longing for meaning, power, and belonging. The Crusades were very much holy wars waged to maintain Christianity's theological and social control. On their way to conquering the Holy Land from the Muslims by force of arms, the crusaders destroyed dozens of Jewish communities and killed thousands because the Jews would not accept the Christian faith. Jews had to be killed in the religious campaign because their very existence challenged the sole truth espoused by the Christian Church. The inquisitors generally saw themselves as educators helping people maintain correct beliefs by pointing out errors in knowledge and judgment... Punishment and death came only to those who refused to admit their errors ... during the Spanish Inquisitions of the fifteenth century, the clear distinction between confession and innocence and remaining in error became muddled.... The investigators had to invent all sorts of techniques, including torture, to ascertain whether ... new converts' beliefs were genuine. During the reformation Christian fanaticism increased between Catholics and the recently formed protestants, many Christians were killed for having rival view point. The reformation set of a chain of sectarian wars between the Catholics and the sectarian protestant culminating in the wars of religions. Extremism within Islam goes back to the 7th century to the Kharijites. From their essentially political position, they developed extreme doctrines that set them apart from both mainstream Sunni and Shiʿa Muslims. The Kharijites were particularly noted for adopting a radical approach to Takfir, whereby they declared other Muslims to be unbelievers and therefore deemed them worthy of death. 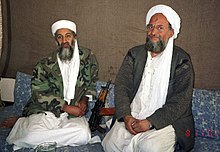 Osama bin Laden and Ayman al-Zawahiri have promoted the overthrow of secular governments. Sayyid Qutb, a figurehead of the Muslim Brotherhood in Egypt, was influential in promoting a Pan-Islamist ideology in the 1960s. When Qutb was executed by the Egyptian government, Ayman al-Zawahiri formed the organization Egyptian Islamic Jihad to replace the government with an Islamic state that would reflect Qutb's ideas for Islamic revival. The Qutbist ideology has been influential in jihadist movements that seek to overthrow secular governments, and Qutb's books have been frequently been cited by Osama bin Laden and Anwar al-Awlaki. Since Osama bin Laden's fatwa in 1998, radical jihad has increasingly become an internationally recognized term. Bin Laden's concept, though, is very different from the actual meaning of the term. In the religious context, jihad most nearly means "working urgently for a certain godly objective, generally an imperialist one". The word jihad in Arabic means 'struggle'. The struggle can be a struggle of implementing the Islamic values in daily activities, a struggle with others to counter arguments against Islam, or self-defense when physically attacked because of belief in Islam. According to Steffen, there are portions of the Qur'an where military jihad is used. As Steffen says, though, "Jihad in these uses is always defensive. Not only does ‘jihad' not endorse acts of military aggression, but ‘jihad' is invoked in Qur'anic passages to indicate how uses of force are always subject to restraint and qualification". This kind of jihad differs greatly from the kind most commonly discussed today. According to certain observers this disregard for others and rampant use of violence is markedly different from the peaceful message that jihad is meant to employ. Although fanatic jihadists have committed many terroristic acts throughout the world, perhaps the best known is the September 11 attacks. According to Ellens, the al-Qaeda members who took part in the terrorist attacks did so out of their belief that, by doing it, they would "enact a devastating blow against the evil of secularized and non-Muslim America. They were cleansing this world, God's temple". ^ Steffen, Lloyd. p. 119. ^ Steffen, Lloyd. p. 120. ^ Steffen, Lloyd. p. 121. ^ Shafer, Grant. p. 193. ^ Ellens, J. Harold. pp. 42–43. ^ Shafer, Grant. p. 236. ^ Selengut, Charles. "Sacred Fury: Understanding Religious Violence." p. 22. ^ Shafer, Grant. p. 239. ^ a b Selengut, Charles. p. 70. ^ "Another battle with Islam's 'true believers'". The Globe and Mail. ^ Mohamad Jebara More Mohamad Jebara. "Imam Mohamad Jebara: Fruits of the tree of extremism". Ottawa Citizen. ^ Lawrence Wright (2006). "2". The Looming Tower. Knopf. ISBN 0-375-41486-X. ^ Scott Shane; Souad Mekhennet & Robert F. Worth (8 May 2010). "Imam's Path From Condemning Terror to Preaching Jihad". The New York Times. Retrieved 13 May 2010. ^ Robert Irwin, "Is this the man who inspired Bin Laden?" The Guardian (1 November 2001). ^ Paul Berman, "The Philosopher of Islamic Terror", New York Times Magazine (23 March 2003). ^ Trevor Stanley. "The Evolution of Al-Qaeda: Osama bin Laden and Abu Musab al-Zarqawi". Retrieved 26 February 2015. ^ Qutbism: An Ideology of Islamic-Fascism Archived 2007-06-09 at the Wayback Machine by Dale C. Eikmeier. From Parameters, Spring 2007, pp. 85–98. ^ Ellens, J. Harold. p. 45. ^ Steffen, Lloyd. p. 224. ^ Ellens, J. Harold. p. 35. Anderson, Paul. "Genocide or Jesus: A God of Conquest or Pacifism?" Destructive Power of Religion: Violence in Judaism, Christianity, and Islam Vol 4. Ed. J. Harold Ellens. Westport: Praegers, 2004. Edwards, John. "Review: Was the Spanish Inquisition Truthful?" The Jewish Quarterly Review 87 (1997): 351-66. Ellens, J. Harold, ed. The Destructive Power of Religion: Violence in Judaism, Christianity, and Islam Vol. 3. Westport: Praegers, 2004. Ellens, J. Harold, ed. Destructive Power of Religion: Violence in Judaism, Christianity, and Islam Vol 4. Westport: Praegers, 2004. Farr, Thomas. "Islam's Way to Freedom." First Things 187 (2008): 24-28. Johnson, J. T. "Opinion, Jihad and Just War." First Things (2002):12-14. Moran, Seán Farrell, "Patrick Pearse and Patriotic Soteriology," in Yonah Alexander and Alan O'Day, The Irish Terrorism Experience, Aldershot: Dartmouth, 17-30. Selengut, Charles. Sacred Fury: Understanding Religious Violence. Lanham: Rowman & Littlefield, 2008. Shafer, Grant. "Hell, Martyrdom, and War: Violence in Early Christianity." The Destructive Power of Religion: Violence in Judaism, Christianity, and Islam Vol. 3. Ed. J. Harold Ellens. Westport: Praegers, 2004. Steffen, Lloyd. Holy War, Just War: Exploring the Moral Meaning of Religious Violence. Lanham: Rowman & Littlefield, 2007. Беляев, И.А. Религиозный фанатизм как иллюзорная компенсация недостаточности духовно-душевных составляющих целостного мироотношения / И.А. Беляев // Вестник Челябинской государственной академии культуры и искусств. — 2011. — № 4 (28). — С. 68-71.